Do you know enough about the inevitable Zombie Apocalypse? And now that you know how fast the process takes for me you might want to head over to the Centers for Disease Control so that you can at least attempt to ward off the zombies. I mean, do you really want to go around eating brains? Not me! BTW, if you’re still reading you probably do not know enough about the upcoming Zombie Apocalyspe. You cannot learn everything there is to know from watching The Walking Dead. 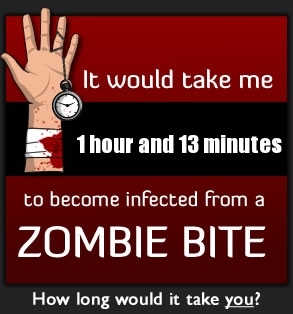 For example, that television show will never be able to tell you how long it’ll take for the bite you receive to turn you into one of the horde of zombies overtaking the world. Click the photo already!